Unless your name is Kevin Costner, or you’re some other 90s movie heartthrob, or you have a Hollywood budget, then stop right there — that’s not how you draw in your audience. That’s great! It really is! We’re not here to rain on any parades, but we are here to help you do more business now that you’ve got the perfect domain name and your site is up and running. To do more business, you need to find the customers or clients interested in what you’re selling. Where are they? Let’s look at two different approaches to finding your ideal audience so you can turn them into your newest customers. It all starts with the right domain. Get yours today at Domain.com. Everyone you know, or could hope to know, is on social media. Except that one guy who decided to move off-the-grid after college. Obviously, this means you should join every single social media network there is, and blast the details of your new site, new products, and, of course, share pictures of yesterday’s lunch. Right? Please don’t do that. Your audience is on social media, that much is true, but they’re not on every single network so you don’t have to be either. Are you launching a new blog or ecommerce site? Consider using Pinterest where you can create and share pins that link to your site’s posts or products. The more your pins are shared, the greater your audience will grow. Pinterest works as a “visual discovery engine for finding ideas,” so make your pins look good. If you’re not a professional designer, don’t panic! There are many free tools like Canva or Unsplash that can fuel your creativity and make creating pins a breeze. If you’re selling products, or have a lifestyle brand, Instagram is a no-brainer. Be there, and be square (no, really, square images at 1080×1080 pixels look best on the platform, even though they’ve recently opened it up for vertical and horizontal images as well). To find your audience, investigate relevant hashtags, and incorporate them into your posts when applicable. If you’re still calling “#” the pound symbol, it’s probably time to upgrade from rotary to smartphone. Instagram tip: Describe your image, or share your story in the caption, but try posting your hashtags in a separate comment. It can influence the algorithm behind the platform and boost your post’s visibility, since posts with engagement (i.e. that comment on your post that’s full of hashtags) perform better. What’s your favorite search engine: Google? DuckDuckGo? Mine is Twitter. If you’re searching for a passionate audience, look to Twitter. Most people search Twitter using hashtags, usernames, or keywords, but it’s capable of so much more. Let’s say you’re opening a local microbrewery, and you’re looking for customers. Search Twitter with an advanced search for people talking about beer in your geographic area using Boolean operators. If they’re already talking about your niche, the likelihood of them talking about your site or store goes up! Boolean operators are simple words and symbols that help to vastly improve your search results. If your search for local beer drinkers is turning up lots of local root beer drinkers, you may want to search “beer -root” (beer MINUS root) to better cater your results. Here’s a handy cheat-sheet including that operator and more. You should spend some time on each social network to find out where your audience is, but don’t invest all your time going hog-wild on each and every social network. Once you’ve identified where your online audience is, invest in those networks. What did people do to find customers before social media? Was it even possible?! Yes. Of course it was. In fact, it still is. If you haven’t looked into your local chamber of commerce, now is the time to start. You, your site, and your business don’t exist in a silo, and your local chamber of commerce can help you build connections to network in your community. Talk to other chamber members to discuss what has and hasn’t worked for their business. You can find a mentor and learn what sort of advertising works best in your area. Talking to other local business owners gives you an advantage that is harder to come by on social media: local word-of-mouth. According to research done by the team at Convince and Convert, Americans value word of mouth recommendations from friends and family a whopping 41% more than social media recommendations. By building relationships with other local entrepreneurs you can find opportunities for joint ventures, and when one of their customers has a need they can’t address, they can refer them to you. Identifying your audience doesn’t have to be a solo task, use the power of community to help. 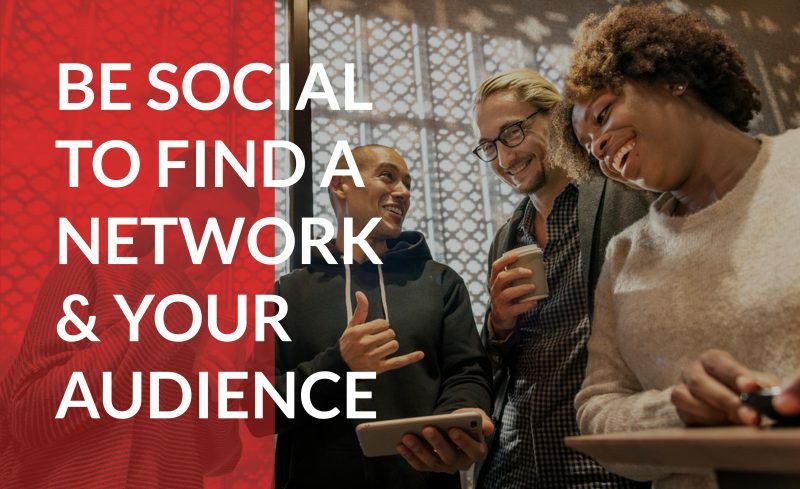 Establish your business on the right social media channel, use it to find customers, and expand your reach into the audiences of other businesses by networking offline. What other tips and tricks do you have to help identify audiences and prospective customers? We’d love to hear them, and we’re sure other entrepreneurs and side-hustlers would, too.